In a world where everything's just about been done, it takes something extraordinary to stand above the crowd. Gerry Duyvestyn’s Ferrari-powered T-bucket fits that bill. The car rides on Ferrari wire wheels, but the rears have been widened to 11 inches. Duyvestyn supplied a matching original pair for the front. Today Duyvestyn is the owner of Forza Automotive, a shop in New South Wales, Australia that specializes in the restoration of vintage hardware from the likes of Ferrari, Lamborghini, and other high end European marques. While wrenching on vintage Italian sports cars certainly seems like a logical outcome for a kid who was obsessed with Ferraris from an early age, it wasn’t Duyvestyn’s initial trajectory. 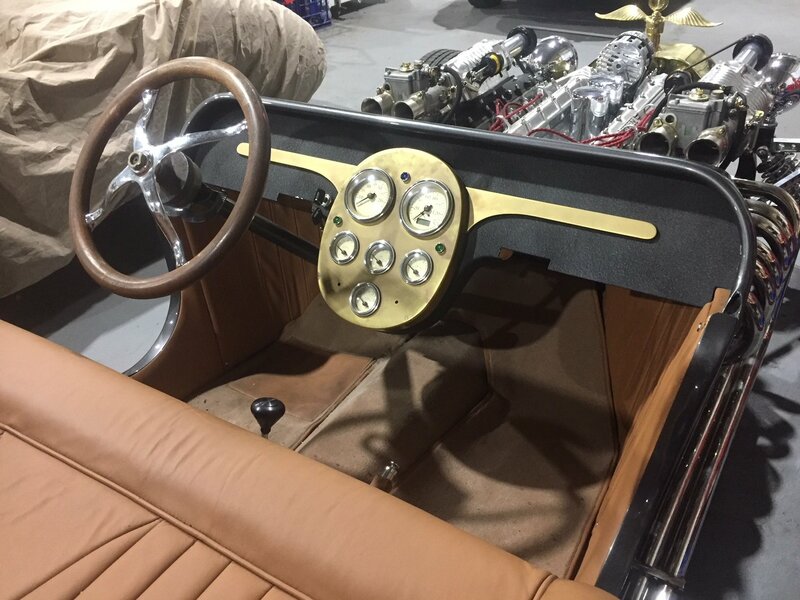 The T Bucket is an amalgamation of vintage American hot rodding and Italian sports car style throughout. While the interior is spartan, it too sports this merger of aesthetics. The T Bucket body sits on a Ferrari chassis and gets motivation from a five-liter V12 from a Ferrari 400 GT that is supplemented by a pair of blowers, a combination Duyvestyn estimates to be good for about 700 horsepower. 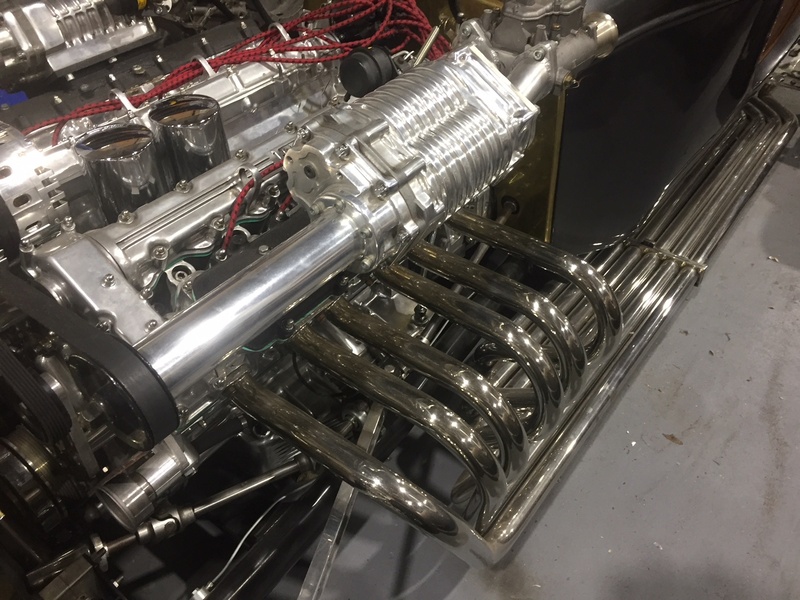 Each one of the V12’s cylinders has an independent straight pipe that runs from the cylinder head all the way to the back of the car. While the shop currently houses the kind of projects you’d expect from a vintage exotic restoration outfit – like a Bugatti Type 55, a Lamborghini Countach LP400 S, a Ferrari 365 California, and Mario Andretti’s Ford-powered March 701 Formula One car, among others – there’s one project that stands out, even among this storied lot. “Hot rods aren’t really on my radar, normally,” Gerry says. 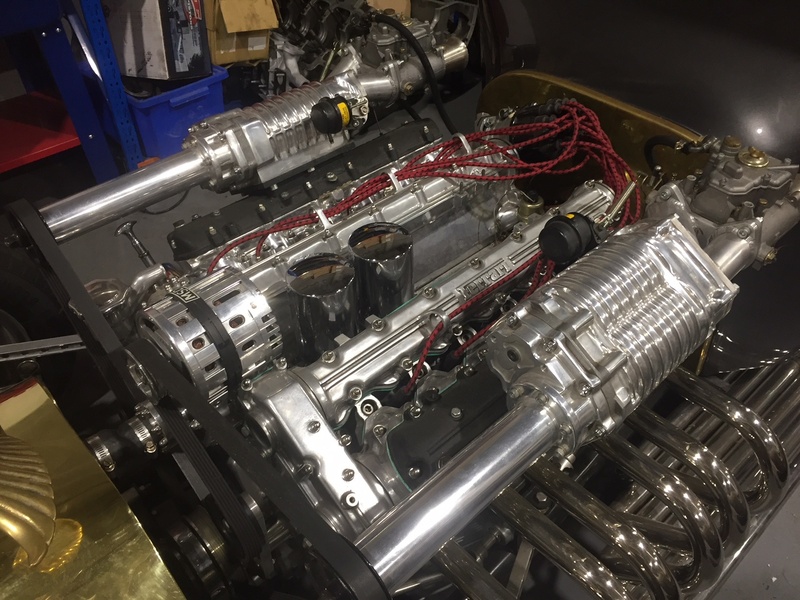 “But one day my friend Bill Young at GT Car Parts in Phoenix, Arizona sent me an email with a photo of this twin-supercharged, fully polished Ferrari V12 engine. On my next visit to his shop, I saw the engine sitting on a palette and asked him about it. 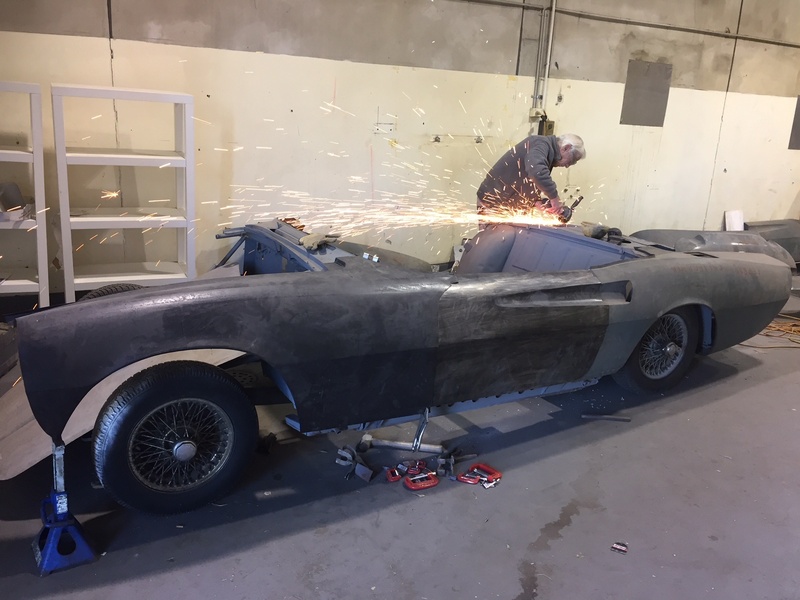 He told me it was an unfinished project from Bob Reisner, a well-known American hot rod builder, and that there was a whole car that went with it. 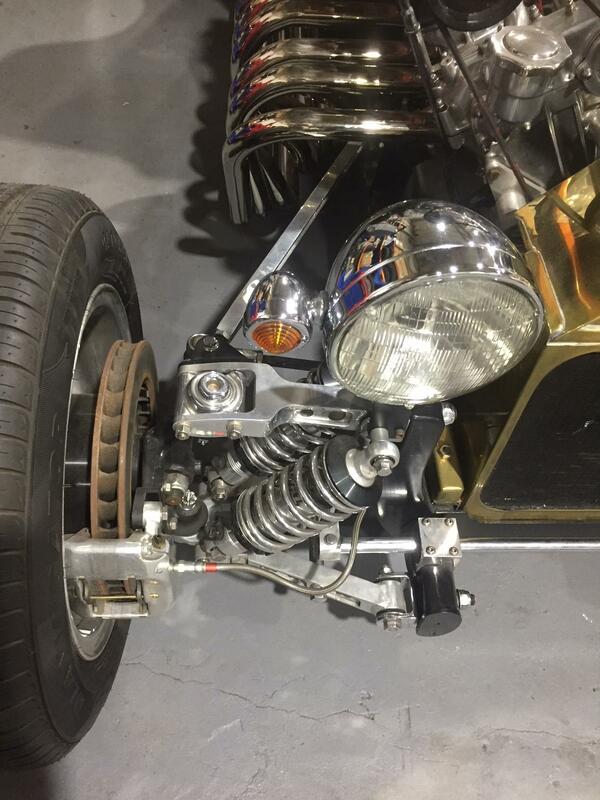 Custom fabrication can be found from stem to stern on the T Bucket. Reisner opted to create suspension arms from billet aluminum instead of using the factory steel Ferrari pieces. 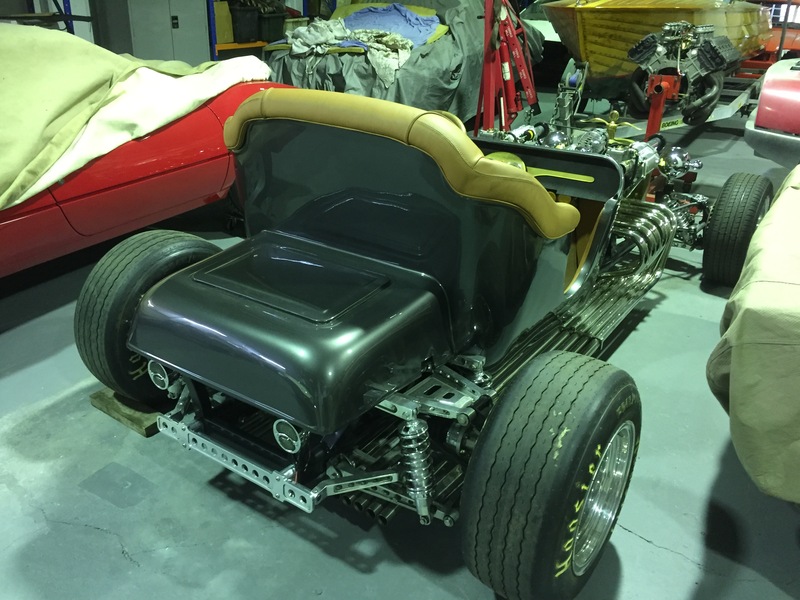 While the car has the look of a Ford T Bucket, it’s actually a full Ferrari chassis underneath that’s been paired up with a steel Ford body mounted on top. The twin-cam, all-aluminum 5.0-liter V12 engine comes from a Ferrari 400 GT and was built largely to factory spec. Matched up with a pair of blowers that Duyvestyn says are of unknown origin, he estimates the power plant is good for about 700 horsepower. The V12 is backed by a modified TH400 gearbox. 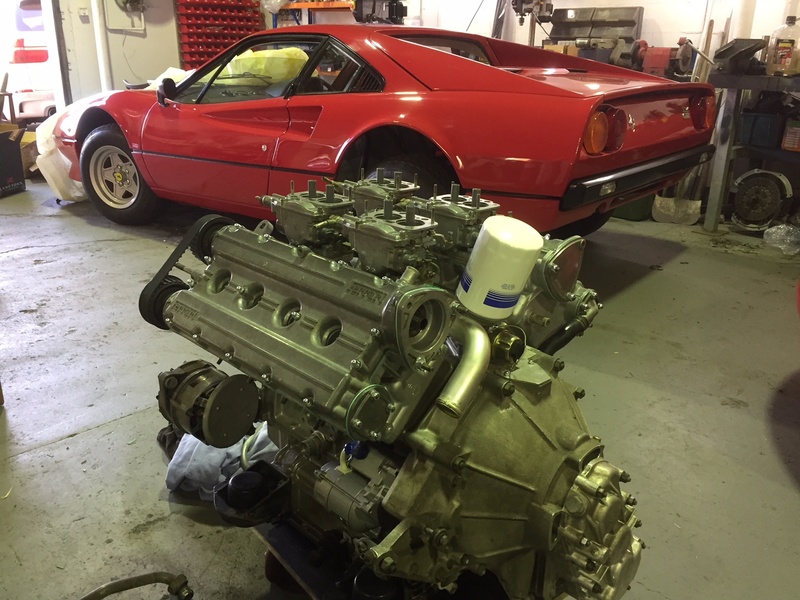 Duyvestyn says he’s been working with JE pistons for more than two decades, due not only to quality of the components but also because of the quick turnaround of parts that he often has built to spec, like the slugs used in this Ferrari 308 GTB’s 2.9-liter V8. The suspension system has some hot rod cues as well. “Instead of using the steel Ferrari factory suspension arms, Bob fabricated them out of billet aluminum.” With a healthy use of aluminum throughout, a trimmed down chassis, and a light weight body, the car is substantially lighter than the Ferrari it’s based on. Duyvestyn says that while he hasn’t put the car on scales, he wouldn’t be surprised if it was under 2000 pounds. “It is a ridiculousthing,” he quips. “I wouldn’t use any piston other than JE in an engine rebuild,” Duyvestyn told us. 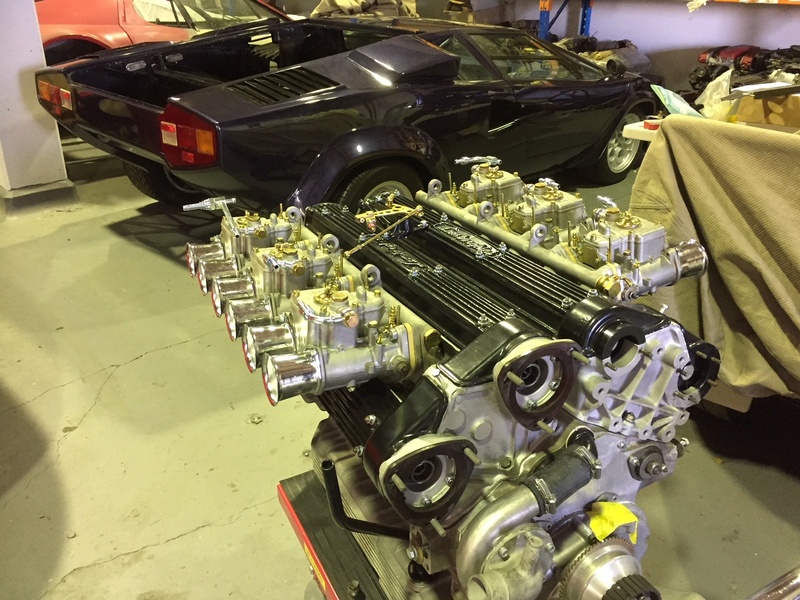 That includes this 5.2-liter V12, which will soon provide motivation for the Lamborghini Countach LP400 S behind it. In the meantime, Gerry is staying busy with all the other projects he’s got in the mix – one of which is really holding a lot his attention these days, and for good reason.